I took a little cue from the sartorial goodness that was Australian Fashion Week and made my best attempt at new found style crush Yasmin Sewell's look here. Aside from missing the beautifully paint splattered pants (sigh), I think I rather liked the end results (and even donned a little head scarf action, which I haven't done in forever!). And if you're in the mood for more turban action -- head on over to these lovely ladies' blogs to see how they styled theirs up: Meghan of Voila!, Amanda of Fashionablee Me, Rebecca of Thirty-Five Inch Inseam, Adiel of It's Because I Think Too Much and Kellen of And So It Goes. Hope you all have a wonderful three-day weekend! This is too chic for words! You look so fabulous in white ensembles! The shoes are the perfect pop of color. What a great shot! I love the floatiness of the top! Yay for Style Challenges! You look amazing and I love the all white look with the pop from the head wrap! Amazing shirt - so chic! Oh wow! Fantastic top, I love it! I seriously love the tail on this shirt! Have a great weekend Krystal. Kimberly Ovits is a master designer and you wear it well. 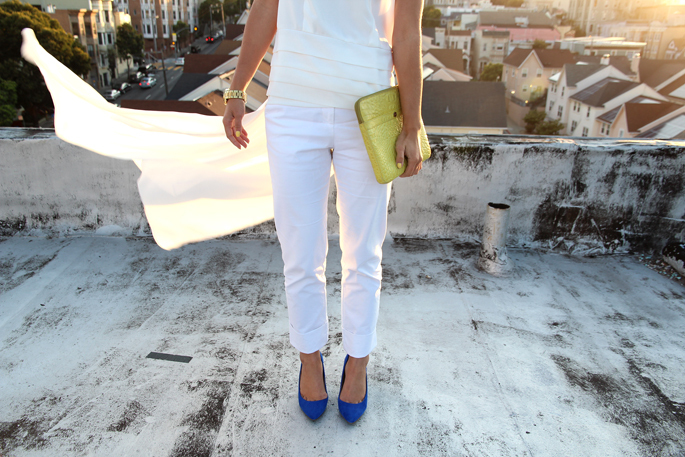 Love the blue shoes and yellow clutch. That Kimberly Ovits blouse looks absolutely stunning on you! i love how you paired it with the electric blue heels and neon clutch. You are so beautiful and all of your looks and photos express that effortlessly. Love the all white with a few pops of colour from those gorgeous accessories! Ovitz is my maiden name, maybe I'm related to this Kimberly. LOL! Love it! these photos are beautiful. cobalt, white and yellow is one of my fave color combos! Gorgeous top!! Love the blue heels! Beautiful combination of colors! Loving it! white is so effortless and always chic. Beautiful photos! I love white outfits. Love the two pops of color against the white! Have a great long weekend! The color palette in this look is fantastic. And, as usual, gorgeous photos m'dear! Great photos! The all white look is gorgeous! You styled the top very well! Nice job! 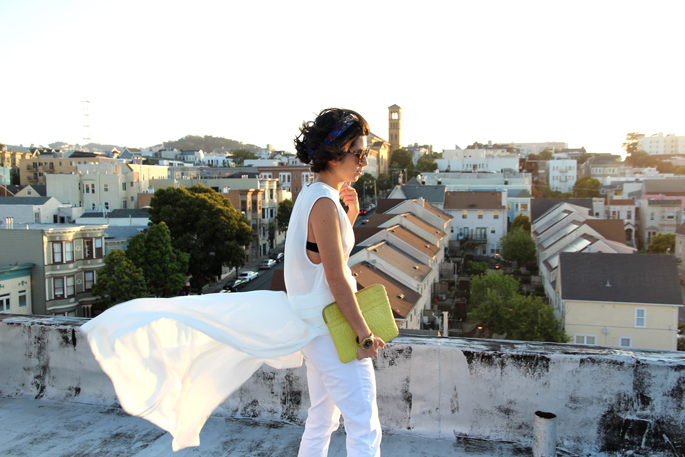 Love total white looks and yours is great! so beautiful dress. amazing pictures.